Last week, over a dozen war veterans had been offered the chance to visit Washington DC by the non-profit organization known as the Honor Flight Network. This is primarily to give these decorated heroes a chance to visit some of the key landmarks within our great city. The special flight took off yesterday morning from Eisenhower airport in Kansas and among the veterans on the trip, there were 10 from World War II, 3 from Vietnam and 14 from the Korean War. After arriving in the nation’s capital, they spent two nights visiting different memorials. There are four more honor flight trips planned for this season with the last occurring in November. Honoring those that sacrificed so much for our country is of paramount importance to all of us here at Gray Line DC. Washington DC is a cornerstone for memorials and sculptures that pay homage to individuals and groups alike. There are both modest and grand memorials situated all over DC, and they are fantastic places to learn about the individuals that inspired their construction. War memorials are located in several locations across the city and are a testament to those individuals who paid the ultimate price to protect our country. They are a physical presence that allows people and the government to pay respect to those that have protected them for so long. 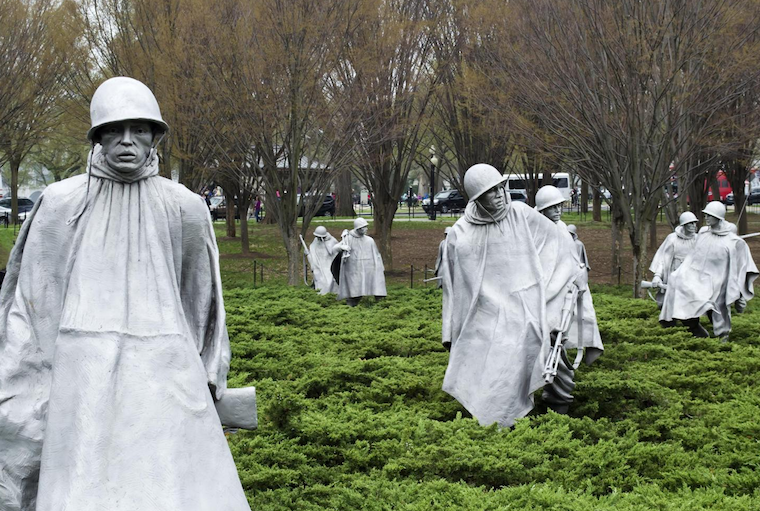 These landmarks represent many historical world events and these include the Iwo Jima Memorial, Korean War Memorial, Vietnam Veterans Memorial Wall and the World War II Memorial. The relevance of these landmarks is massively significant to the veterans that are about to visit them. They are each unique in their construction and extremely interesting, and a lot of individuals consider each of them as works of art in their own special way. These four memorials, in particular, can be seen up close and personal with each one designed to truly represent those lost during these historical conflicts with an artistic expression of the sacrifices that they made. Some even have the names of soldiers engraved on the monument so that visitors can truly appreciate and comprehend the number of people lost during that particular conflict. We really appreciate and respect the work the Honor Flight Network does for our veterans and here at Gray Line, we can offer the perfect packages for those wishing to visit these historical sites. Also, as we remember events such as World War II that threatened the entire existence of our nation, we would just like to finish by saying thank you to those who, without their sacrifice, mean that we might not be standing here today. We hope that the veterans visiting our city enjoy their trips! If you’d like to visit a range of war memorials with us then take a look at our tours section to find the right one for you. Learn about wars, battles and the people behind them with our talented tour operators.